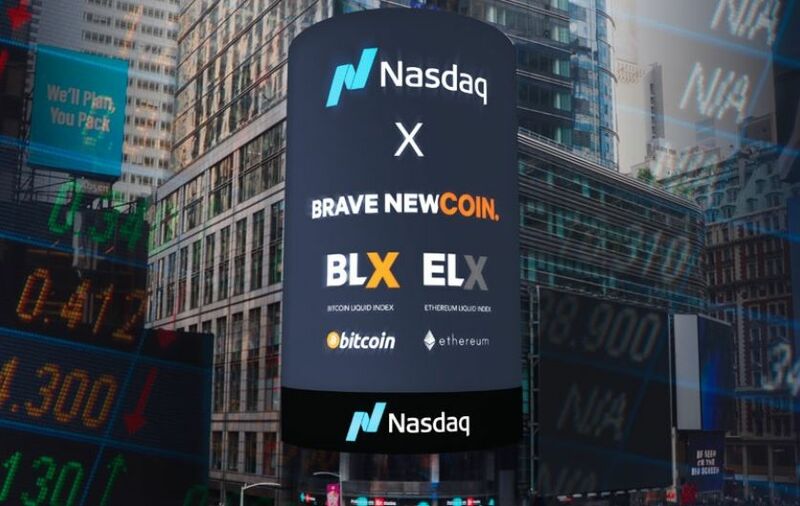 The ultimate leading benchmark for the entire US technology equity, Nasdaq, has now launched Bitcoin (BLX) and Ethereum (ELX), Brave New Coin’s Bitcoin and Ethereum Liquidity Indexes respectively. The Nasdaq platform hosts 4,000 global indices and the move to launch these crypto indices shows that cryptocurrencies are gradually gaining mass acceptance and adoption in the business world. BLX and ELX create price transparency. The BLX (orange line) is an aggregate of bitcoin spot prices on six of the biggest exchanges; here it shows the Bitfinex premium of ~$80 over its peers. BNC announced that is also near to the launch of an XRP liquid index that will track Ripple’s crypto asset. 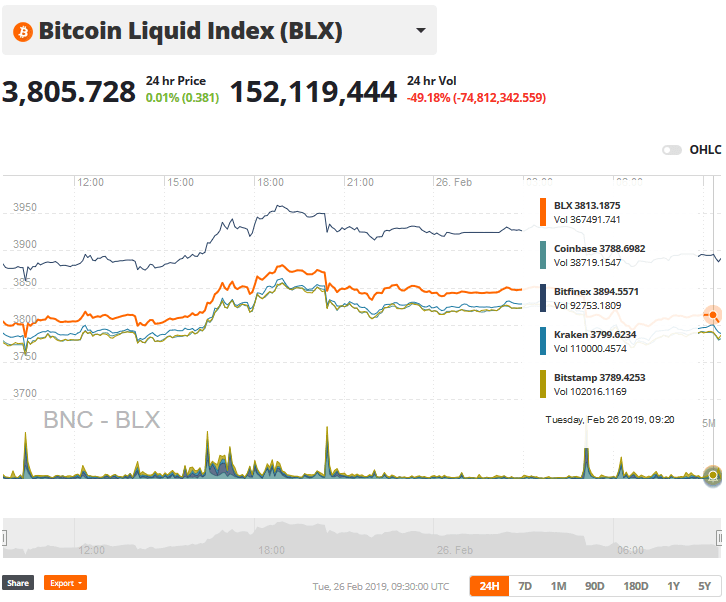 Just a week after the first significant crypto announcement for the year, Nasdaq launched its listing of BNC’s BLX and ELX indices. The institutional endorsement is what most of the investors have been waiting for even as Nasdaq plans to introduce a bitcoin futures market together with Intercontinental Exchange’s (ICE) Bakkt futures market. Bakkt was set for launch on January 23 but several issues have led to its postponement to an undetermined date in Q2 2019. Several vendors are striving relentlessly to bring the Bitcoin ETF to the US market. The Liquid Index’ (LX) indices operated by BNC are partially quantitative and partially qualitative. They factor in the quality and stability of constituency on one side. On the other hand, they consider book depth, volume, tick size, and several other factors form the qualified market participants. All that information is used to calculate a fair global value for the price of ETH and BTC expressed in USD after every 30 seconds. That strategy adds to the transparency of pricing the crypto assets, a major concern that has made regulators hesitant to approve retail products. BNC is now finalizing on the RLX (Ripple Liquid Index) and is working with many participants to develop custom basket indices. The CEO of BNC, Fran Strajnar, explained that the LX program offers clear and transparent price discovery of all the involved liquid cryptographic assets. XRP was boosted by the “Coinbase pump” (XRP is launching on Coinbase Pro) that raised it by 10% to $0.33 USD from $0.30 USD. Thus, Coinbase Pro may become part of the RLX. Mr. Strajnar confirmed that the ‘LX’ family of BNC indices has already been audited independently against the International Organisation of Securities Commissions (IOSCO) principles. He also stated that BNC is in talks with several market participants and they hope to share more development on the financial instruments managing the crypto industry soon. The listing on Nasdaq will propel BNC ahead of their competition as traders and investors await a huge market recovery in the future.